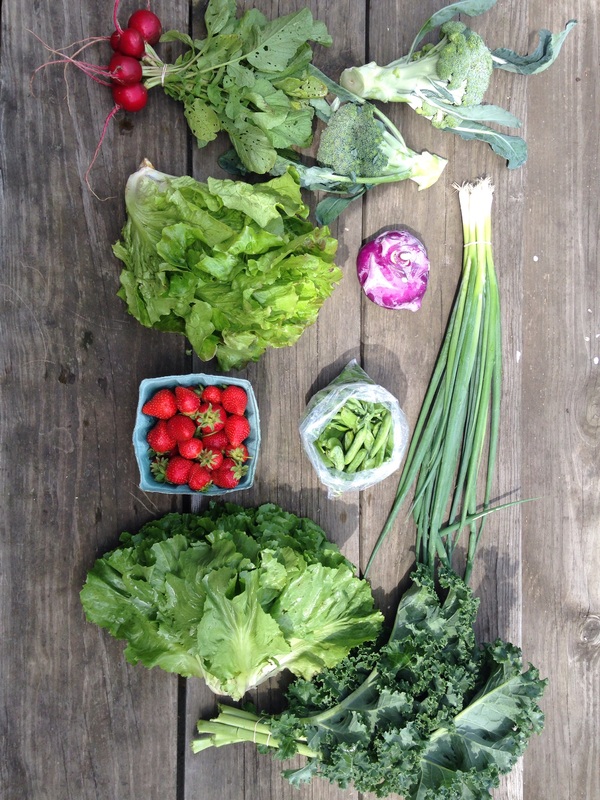 The farm season is in full swing and the eatin’ is good. I try to take something home from the field every night and sometimes it really starts to pile up in the fridges (yes fridges), but hey, I’m not complaining. Every meal is a new adventure. It’s a constant race to try and cook up all the vegetables before they go bad. It’s Wisconsin. The growing season is short and this seasonal goodness won’t last forever. I’m going to soak up every second. Right now, the zucchinis and summer squash are oh so close to being full-size. While I wait (impatiently) for summer’s first squash, I harvest a bunch of the male squash blossoms because did you know you can harvest male squash blossoms without sacrificing any of your summer squash and zucchini bounty?! 1. I think eating flowers is so much fun! 2. I hate wasting any part of a plant that is edible. 3. I’m not patient. At all. And harvesting squash blossoms gives me an excuse to check on the little baby zucchinis everyday without any “watched pot never boils” syndrome. Hey, I was just harvesting squash blossoms! I would never check the progress of little zucchinis three times in one day! 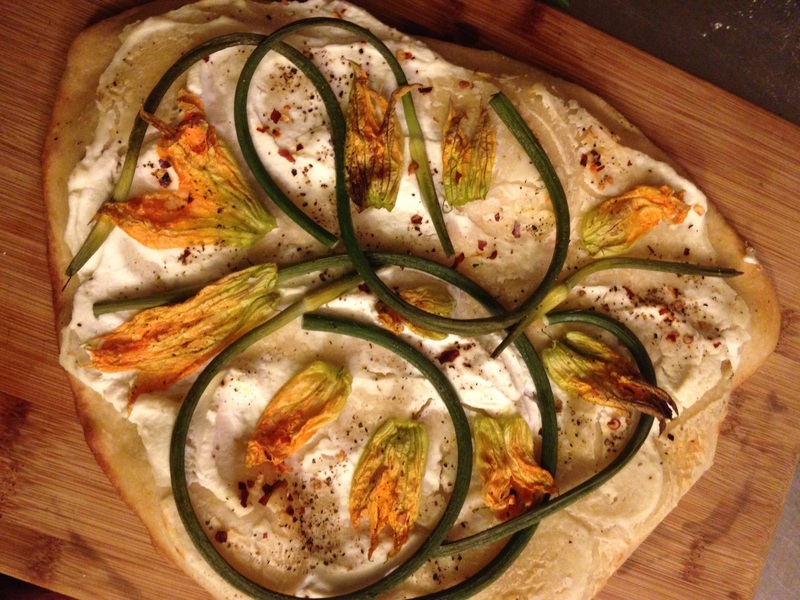 On this particular pizza I married squash blossoms with my other favorite vegetable growing byproduct: garlic scapes! Garlic scapes just kind of happen when you grow hard-neck garlic. A farmer has no control over them. The plant just shoots up this stalk (a scape) in late spring and you have to cut it off or it will take up too much of the plant’s energy. And guess what?! These little things you have to cut off the garlic plant taste like garlic, but fresher and more summery. You can use a lot of garlic scapes because they don’t have the bite of fresh garlic. You won’t even get the garlic breath. If your scapes are already all used up for summer (mine always go so very quickly), feel free to sub in 2 cloves of minced garlic. I’d mix the minced garlic right into the ricotta if I were you. This pizza is light and fresh and pure summer happiness. You can cook it in a super hot oven like I did or I’m sure you could also grill it. I have yet to try grilling pizza but I can imagine the flavor and am quite certain these toppings would be glorious. Preheat oven to 500 degrees. Roll out your pizza dough on a well-floured counter. Lay out on an oiled cookie sheet. Bake crust for 5 minutes. Remove crust from oven. Spread ricotta evenly on top. Add garlic scapes and press them gently into the ricotta (I did not do this and my scapes kept falling all over the place). 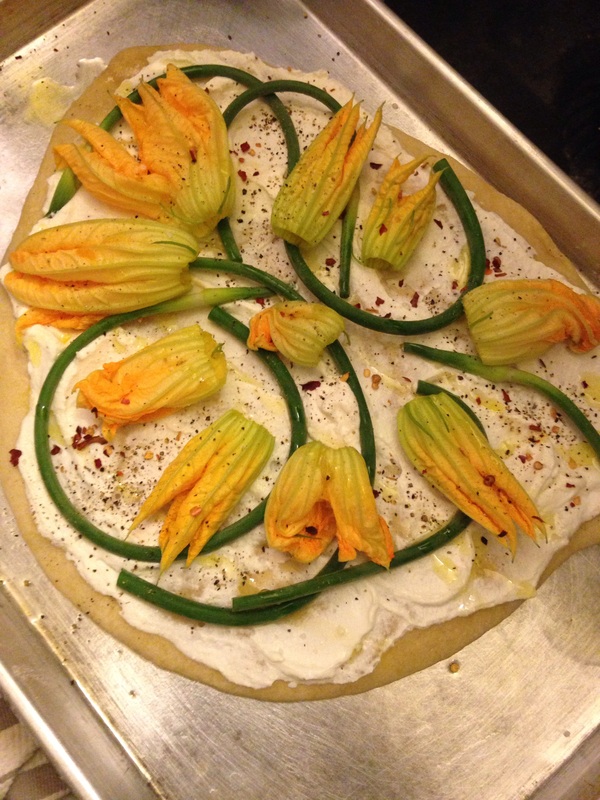 Arrange the squash blossoms on top. Drizzle with olive oil and sprinkle with seasonings. Bake for 10 minutes. Remove from oven. Add shaved parmesan. Bake 5 minutes longer until crust is golden brown and crisp.